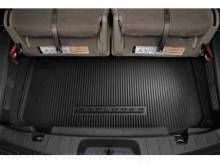 Cargo Area Protector * Fits in the spare tire area underneath 3rd Row Seat. * Durable, lightweight black tray is molded to the contours of your vehicle. * Raised lip helps contain spills. * Installs and removes easily without tools.